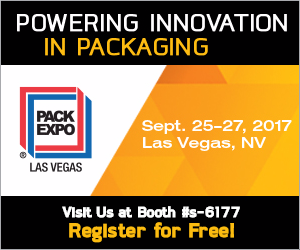 In a little over two months, Masipack | Fabrima will participate in PACK EXPO Las Vegas 2017, North America’s premier packaging event at Booth S-6177. The event will be held at the Las Vegas Convention Center in Las Vegas, NV, September 25th through the 27th. There will be 2,000+ exhibitors representing 40+ vertical markets who will showcase their latest equipment over a 875,000 net square foot show floor to over 30,000 attendees. PACK EXPO’s “Innovation Stage” will feature on-floor educational presentations by exhibitors who have elected to participate; this adds to the educational benefit of attending the show. We are super excited to participate at PACK EXPO again, and look forward to catching up with current customers as well as meeting new ones!